Austrian scholar; born at Tysmenitz, Galicia, Dec. 21, 1805; died at Galatz, Rumania, Aug. 6, 1870. After having studied Talmud and rabbinics in his native town, Pineles at the age of fifteen removed to Brody, where he married. In his new home he began to study German and the secular sciences, particularly astronomy. As most of the Jews of Brody at that time were of the Ḥasidic type, Pineles was, on account of his scientific studies, accused of heresy, and was obliged to justify himself before his father-in-law. About 1853 Pineles went to Odessa, where he lived till the Crimean war (1855), and then he settled permanently at Galatz. 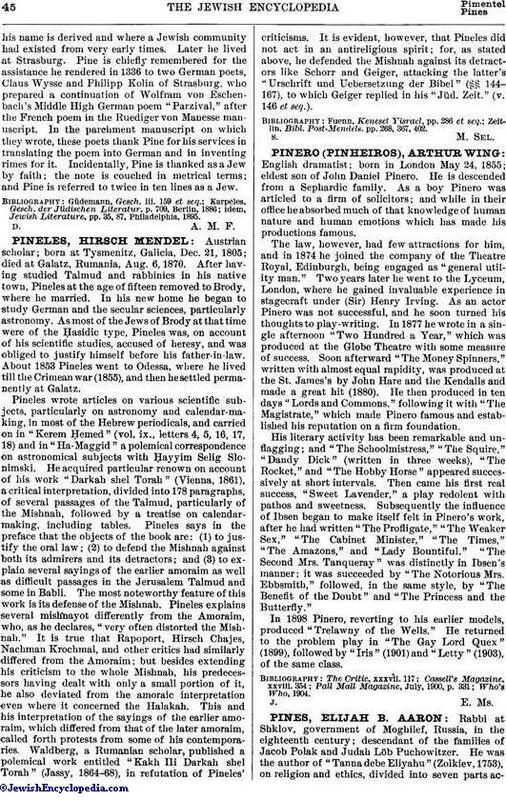 Pineles wrote articles on various scientific subjects, particularly on astronomy and calendar-making, in most of the Hebrew periodicals, and carried on in "Kerem Ḥemed" (vol. ix., letters 4, 5, 16, 17, 18) and in "Ha-Maggid" a polemical correspondence on astronomical subjects with Ḥayyim Selig Slonimski. He acquired particular renown on account of his work "Darkah shel Torah" (Vienna, 1861), a critical interpretation, divided into 178 paragraphs, of several passages of the Talmud, particularly of the Mishnah, followed by a treatise on calendar-making, including tables. Pineles says in the preface that the objects of the book are: (1) to justify the oral law; (2) to defend the Mishnah against both its admirers and its detractors; and (3) to explain several sayings of the earlier amoraim as well as difficult passages in the Jerusalem Talmud and some in Babli. The most noteworthy feature of this work is its defense of the Mishnah. Pineles explains several mishnayot differently from the Amoraim, who, as he declares, "very often distorted the Mishnah." It is true that Rapoport, Hirsch Chajes, Nachman Krochmal, and other critics had similarly differed from the Amoraim; but besides extending his criticism to the whole Mishnah, his predecessors having dealt with only a small portion of it, he also deviated from the amoraic interpretation even where it concerned the Halakah. This and his interpretation of the sayings of the earlier amoraim, which differed from that of the later amoraim, called forth protests from some of his contemporaries. Waldberg, a Rumanian scholar, published a polemical work entitled "Kakh Hi Darkah shel Torah" (Jassy, 1864-68), in refutation of Pineles' criticisms. It is evident, however, that Pineles did not act in an antireligious spirit; for, as stated above, he defended the Mishnah against its detractors like Schorr and Geiger, attacking the latter's "Urschrift und Uebersetzung der Bibel" (§§ 144-167), to which Geiger replied in his "Jüd. Zeit." (v. 146 et seq.). Zeitlin, Bibl. Post-Mendels, pp. 268, 367, 402.